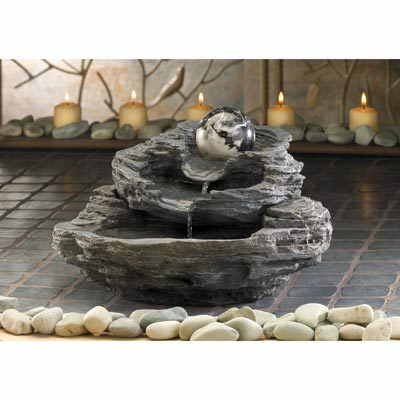 34807 Rock Design Tabletop Fountain home decor, jewelry, decor, decorations, electronics, fountains, floor mats, art glass, vases, garden essentials, fireplace screens. Water cascades from beneath the gently spinning marbleized orb, showering the rocklike tiers below. 120v pump included. UL Recognized. Alabastrite. 10 3/4" x 10 3/4" x 6 1/2" high.